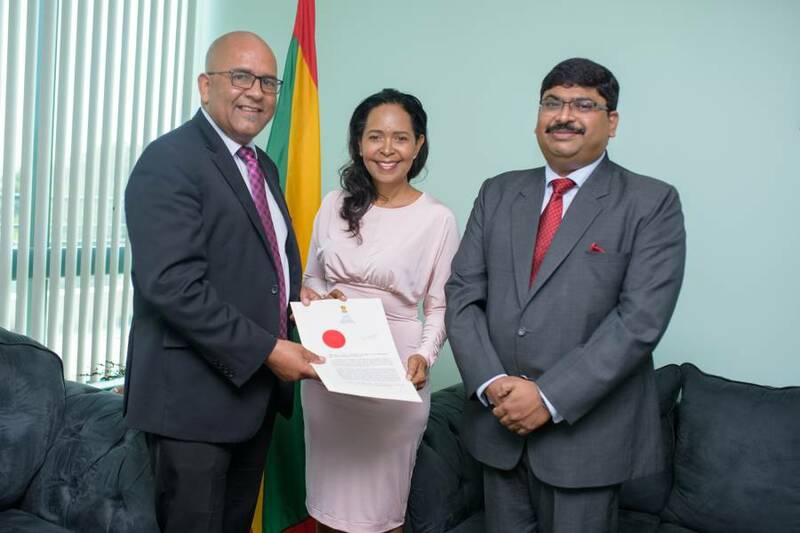 Shadel Nyack Compton, Grenadian attorney and Managing Director of Belmont Estate, has been appointed as the first Honorary Consul of India to Grenada this afternoon. High Commissioner of India to the Republic of Trinidad and Tobago, accredited to Dominica, Montserrat and Grenada, His Excellency Bishwadip Dey, was present as Nyack Compton presented her Letters of Instrument to Minister of Foreign Affairs, Honourable Peter David. During the presentation, Minister David extended congratulations to both the Office of the Indian High Commission and Nyack Compton for this momentous appointment. Minister David confirmed that he was certain that Nyack Compton will deepen relations between the 2 countries and improve people to people relations as well. High Commissioner, His Excellency Bishwadip Dey thanked the minister for accepting the appointment of Nyack Compton and expressed his interest in exploring new areas of collaboration between the 2 governments. As Honorary Consul, Nyack Compton’s primary duties will include taking care of the affairs of Indian citizens to aid them in their lawful and mercantile concerns, enhancement of bilateral relations of trade, business, investment and culture between India and Grenada. “I am deeply honoured to receive this appointment, and extremely grateful to the governments of India and Grenada for this opportunity and for the trust placed in me. As a proud Indo-Grenadian, I am grateful for this opportunity to serve India, its nationals and the diaspora family here in Grenada, and to contribute to the business growth and development of Grenada through the strengthening of relations between the 2 countries,” Nyack Compton said. She likewise stated that her commitment to serve the 2 countries under the High Commission Office in Trinidad not only rises from her romance and nostalgia for India, but also materialises from her immense love and loyalty for Grenada. Nyack Compton is a graduate of Georgetown University Law Centre in Washington DC, and Hugh Wooding Law School, University of the West Indies in Trinidad and Tobago. Holding a Masters in Agribusiness from Kansas State University, she serves as the Managing Director of Belmont Estate, a family-owned and award-winning agri-tourism business. Under her leadership, the company has grown into a leading agri-tourism business in the Caribbean, recognised for its contribution to employment, education, community development, and to offering extraordinary service and high quality organic products. A former Chairman of the Grenada Board of Tourism, Nyack Compton is extremely passionate about Grenada, and promotes the sustainable development of Grenada’s agriculture and tourism sectors. Nyack Compton’s work in the Indo-Grenadian community is seen in her leadership as the President of the Indo-Grenadian Heritage Foundation. She was a pivotal force lobbying government for a declaration to make Indian Arrival Day a national holiday. This was successfully achieved last year, with the consent of the Grenada Trades Union Council, sharing the holiday with Labour Day. Nyack Compton has been actively involved with the foundation for the last 10 years, raising awareness about India, and Grenada’s Indian history and heritage. She credits her parents and grandparents for raising her with a strong appreciation for her Indian roots. She has vigorously used her business at Belmont Estate to educate and entertain with Indian Arrival Day celebrations, hosting annual fundraising luncheons, showcasing cultural activities, and museum exhibitions on Indian heritage. She also continues to write on Indo-Grenadian issues. Acknowledging the significance of this appointment, Nyack Compton added, “To receive this appointment at a time when India is proactively elevating the status of women in its country is truly meaningful. As a woman of Indian descent, it is humbling to receive such an honour to serve India in a capacity that can benefit both a country of a billion people and an island of a hundred thousand people. I intend to do my best to strengthen the relations of India and Grenada and expand the bilateral cooperation in the areas of trade, agriculture, education, and technology.” Nyack Compton’s appointment comes one day before the 161st Anniversary of Indian Arrival Day (IAD) on 1 May. Belmont Estate is once again hosting the IAD with a celebratory luncheon and cultural entertainment. The IAD is commemorated alongside Grenada’s Labour Day.